The Baader Zoom Barlow is 2.25x. That means the 24-8mm range becomes a 10.7-3.6mm range. The Barlow is a simple thread-on unit, and then you have a 3.6mm to 24mm range. But then you have to fiddle with screwing the Barlow on and off. I'd rather switch back and forth between a couple eyepieces than deal with screwing that little Barlow on and off in the dark. I do have two Baader Zooms. I could take them both out and keep the Barlow on one of them. But I don't like putting that Baader Zoom plus Baader Barlow at the end of a diagonal. It is a cantilever. I don't like cantilevers. In fact, I only use the Baader Zoom + Baader Barlow in 2" format. Then I put a 2" extension over the little Barlow. The whole end below the shoulder fits into a Dob focuser. Still not so good for telescopes that use a diagonal. Besides, the Baader + Baader Zoom only goes down to 3.6mm, not 3mm like the Nagler Zoom. I think I'll stick with the Baader 8-24 Zoom and Nagler 3-6 Zoom. I suppose I could bring along the 7 DeLite to help bridge the gap between 8 and 6. Edited by Sarkikos, 05 September 2017 - 05:57 AM. I use a 3x Barlow, which gives me a continuous 24mm-2.7mm. If you want to go your route, and bridge the gap between 8mm and 6mm, you need more than just a 7mm. How about a Morpheus 6.5mm, along with a Kasai 7.5mm, which is still being sold. All three together would make a great gap bridge. Edited by Peter Besenbruch, 06 September 2017 - 08:24 PM. With most any Barlow on an eyepiece that goes into a diagonal, you tend to create the cantilever effect. I like to avoid that. 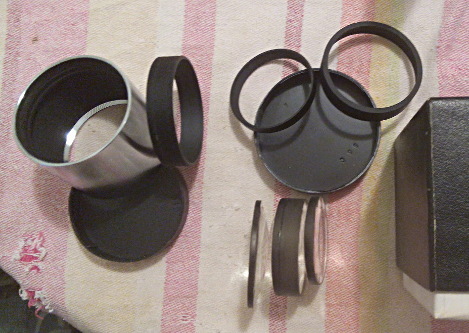 Oh, I have other eyepieces to more thoroughly fill in that 6-to-8mm gap. But then I would be upsetting my grab-n-go protocol. 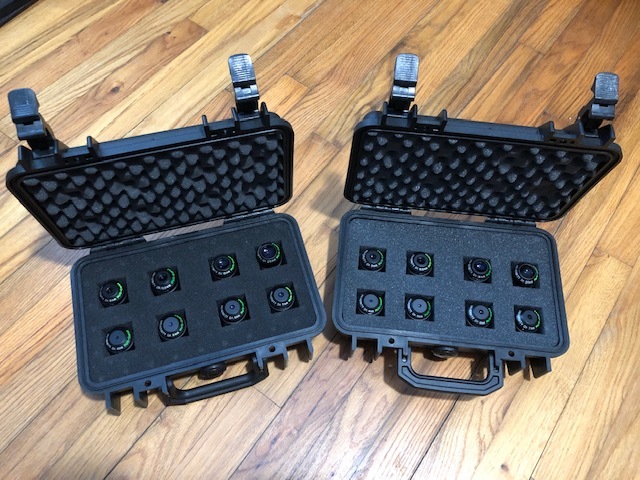 IMO, bringing out a half-dozen or more eyepieces for grab-n-go can get a little silly. A half dozen? You need to do your part to uphold the dignity and honor of the G&G community. Start with two dozen, and work your way up. You can't go back home.....fond memories of the "good old days." Where in Zeeb Rd was the shop? I don't remember many businesses there in 1975, PB's & UMI maybe. Edited by mich_al, 08 September 2017 - 07:48 PM. I don't remember. I didn't drive, my mom did. I remember it being a small single room metal building. But it was a long time ago. I think the building was behind his house. It certainly was a small out building on his property. It would be easy to miss if you weren't looking for it. Also,remember lots of this early stuff was before the Internet.....S&T advertising and ??? was the source of knowing about UO. I learned about UO from a shop in Oakland/Berkeley, California where I bought my UO 11x70 binoculars in the 70s. Edited by Mr. Bill, 09 September 2017 - 09:32 AM. I learned about UO from a shop in Oakland/Berkeley, California where I bought my UO 15x70 binoculars in the 70s. I think my first purchase from UO was an ortho eyepiece back in the early '70's. The eyepiece is long gone now. I included it when I sold my Edmund Palomar 4-1/4" f/10 Newt to a middle school science teacher in the early '80's. The year I sold it, not the teacher. Edited by Jan Owen, 10 September 2017 - 03:01 PM. Very sorry to hear this but everyone deserves a bit of retirement. UO has served the amateur astronomy community very well over the years... yet another reason to treasure my UO VTs. Just came across this news! I echo all the other positive tributes to UO. I have a number of their EP's and their Orthos hang in there with my Brandons and Delos while costing a fraction of their price. Can't help but feel a little bit of loss, although I wish the owners all the best. 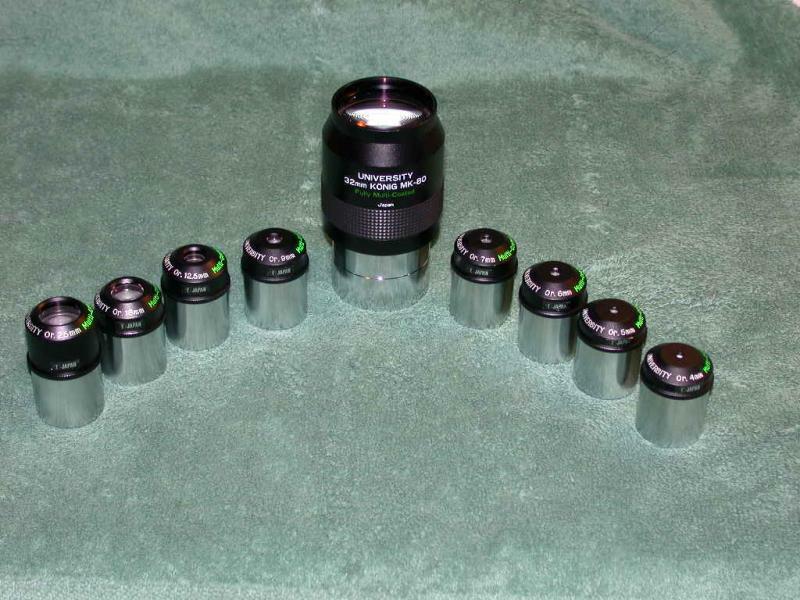 Here's a photo of the University Optics eyepieces that the Astronomical Society of Harrisburg owns - a 55mm Plössl, a 40mm MK-70, a 45mm Plössl, a 32mm König, a 25mm MK-70, and a 1.25" 32mm König. Truly sad to see them go. Personally I love my UO VT orthos and very glad I bought them when I did. I did have a set of the original Baader ones as well but sold them when people started paying silly money for them in the great ortho stampede a few years back. Got a nice surprise when receiving it this evening, the ad pictures was'nt speaking about the brand. AD's picture on the left. I don't know this version : was packed as new as the vendor said. Way back in 1969 I bought a set of their UO Professional Orthos (4, 6.8, 10.2, 28, plus the 16mm Koenig) and used them as my main eyepieces for 25 years. I loved their little leather cases. When I was working for Gary Hand I ended up selling them to him so I could buy a set of the then new Pentax XLs as I finally gave in to using my glasses for observing. Right now I have one UO eyepiece that I picked up last year, the UO 55mm Plossl. I have now owned the big three of that size, the TV 55 Plossl, the Meade 1st gen 56mm Super Plossl, and finally the UO 55mm Plossl. They were all very good. Still have the Pentax's after another 25 years. I've shown these before, but I thought it might be appropriate for this thread. I've tested everyone of these and they produce perfect Airy discs from edge to edge in my 6" f/8 APO. 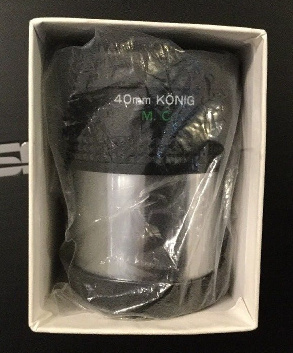 Except for the 2" Konig, which needs at least f/10 for the same performance, but nevertheless is a fine wide field eyepiece. Edited by daquad, 25 January 2019 - 08:01 PM. I like mine, so glad I got them. Two full sets no undercuts except for one 25mm, it has the undercut, not that I care but some hate those undercuts. I use them all the time, absolutely love the volcano top design. My fave University eyepiece is the 12.5mm Plossl. Good eye relief and eye positioning. I do a lot of RFT work with an 8" f/4 Newt and this is my go-to as a high power eyepiece. My newly acquired Questar 3.5 came with 24mm and 16mm Questar-Brandon earpieces. The UO is as good the Brandons and serves as my high-power eyepiece. The 12.5mm is at 100x (30x per inch) and 200x (60x per inch), and I'd like to see what an 8mm ocular will do-- 162x (45x per inch) and 325x (90x per inch) pushing the limits. 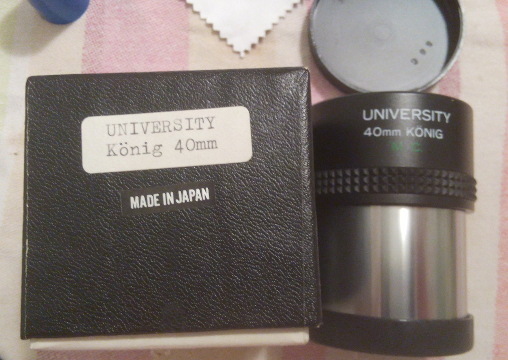 The other University Optics eyepiece is a 32mm Koenig in a 2" barrel. Sharp to the edge of the field in my 8" f/4 scope. I have the field stop modified to a 24mm x 36mm rectangular shape. It serves as an astrophotographic framing tool, even with my new CCD system. Stars look a bit astigmatic at the extreme edges, but not terribly so. My favorite was the 32MK80 and 40MK70. I have a desire to acquire a set of abbe ortho's but I know I'd rarely use them. Have them both.....but time moves on; they were good in their era but lots better now.